I stumbled across an interesting article recently from the Miami Herald about the ongoing struggle to re-invent and re-invigorate the newspaper business. Some great commentary by Herald columnist Leonard Pitts Jr. after news broke that upwards of 190 Herald employees may be let go. Virtually every newspaper is going through the same thing: shrinking profit margins, declining circulation, staff cutbacks and morale at subterranean levels as journalists struggle to figure out how we can save the American newspaper. But I have come — reluctantly — to believe we can’t. We must blow it up instead. Doing otherwise is like trying to save record albums in an era where music is downloaded to iPods, trying to save film in an era where every camera is digital. People did not stop listening to music or taking pictures, but new methods of doing so evolved, and those who were in the business of selling music or pictures had to adapt or die. We in the business of selling news have yet to adapt. Yes, every newspaper has a website now. Some, like The Herald, have TV and radio facilities as well. I’m talking about something more: a radical change of focus. We still tend to regard our websites as ancillary to our primary mission of producing newspapers. But I submit that our primary mission is to report and comment upon the news and that it is the newspaper itself that has become ancillary. So maybe we should regard the Internet not as an extra thing we do, but as the core thing we do. The sign of things to come? Is news on paper really dying? That depends on who you ask. I truly believe newspapers will be around for a long time yet. But they must evolve and embrace change. I added some flotsam and jetsam on this topic a few years ago. While debating the newspaper’s future is much traveled territory, one association is grabbing the bull by the horns. The International Newspaper Marketing Association has just announced that they are changing their name. INMA is changing its name to reflect the evolution of its member newspapers and lead the newspaper industry toward its multi-media future. Much has been written and said about how much Craigslist is contributing to the demise of the newspaper business. While Craigslist is single-handedly killing the print classifieds business, there are other storm clouds brewing that are just as worrisome for newspapers. Chrysler is about to embark on a major launch campaign for a car called the Dodge Journey, but for the newspaper business they might as well nickname the car Dodge Doom. The upcoming advertising campaign serves as a microcosm on several fronts. It illustrates both why newspapers are seeing a drastic cut in revenues, and also why internet advertising revenues will continue to grow despite a weak economy.Chrysler is spending $35 million to launch the Dodge Journey which is the same amount they spent last year when they launched the Dodge Nitro. The big difference is not in the total ad spend, it’s where the money is going or not going. Two years ago, Chrysler allocated 5% of their launch budget to online/interactive media. This year, that number is 29% which marks the single largest online ad spend for Chrysler to date. The reason the company likes online is that it gets so much direct feedback from web consumers — it says it has already made 400 changes to 2008 and 2009 models based on customer web feedback. Television is still getting the most allocation at 54%, followed by 29% for online, 9% for print and 4% for radio. Of the 9% for print, the majority of it is going to magazines, not newspapers. Now you can begin to understand the gravity of the situation for the newspaper business. For a major automaker to spend $35 million to bring mass awareness to a new product and then subsequently choose (for the most part) to do it without targeting newspaper readers, is a major shift. BusinessWeek has an article that focuses on the plight of newspapers, and specifically suggests that a wave of newspapers could/should consider quitting the paper business altogether and publish exclusively on the web. It’s an interesting perspective, but one I would argue is flawed. Shutting down a diminishing or losing print business will save a media company plenty of dough on the expense side, but the paper business also represents (currently anyways) a much larger piece of the revenue pie than the internet side of the mainstream publishing business – and therein lies the rub. It’s not so simple to say, ‘stop the presses’, because doing so to a large degree also equates to ‘stop the cash flow’. In author Jon Fine’s point of view – it’s the San Francisco Chronicle that should be first in line to ditch paper, a notion that seems credible on the surface given that the Chronicle is currently losing approx. $1 million per week. Ouch, yes you read that correctly. Vin Crosbie over at Corante has a good rebuttal to Jon’s ‘web-only’ newspaper fix. If newspapers ever do seriously consider making a web-only leap, they had better have a major strategy in place for brand extension on the web. As the web market continues to mature and saturate, you are going to want to have more than one brand-ball in play. Historically speaking, broadcast mediums don’t die. Newspapers will be around for a long time yet, but the evolution process won’t come without its bumps, bruises, and inevitably, some casualties. In a state of constant flux, the newspaper industry continues to adapt and make proactive changes in an effort to cut costs and entice a new generation of readers. The Toronto Star announced today that they are shaving 4-inches off the width of their newspaper, a move that will take it from the current 50-inch broadsheet width to a leaner 46-inch format. This move accomplishes two things, it cuts printing costs, and it makes it more ‘user friendly’ for the next-gen newspaper reader. It’s a great move, and is consistent with an industry-wide trend to get smaller. The Star is only the second newspaper in North America to adopt the 46-inch width, following North Dakota’s Bismarck Tribune which pioneered the format back in 2005. The Toronto Star deserves credit for being among the most aggressive industry-wide in changing formats. Back in 1992, the Toronto Star was the first newspaper in North America to cut its width from the traditional 54-inch broadsheet to a (current) modified 50-inches wide.On the heels of this news, I thought it would be interesting to re-visit a whimsical blog post I wrote back in February 2006 about the the future of newsprint and how famous newspaper designer Mario Garcia was orchestrating a major renovation of the Wall Street Journal. I’ve long been fascinated with media as a delivery mechanism of information and in particular how that mechanism is designed. Anyone who has talked to me about the traditional/broadsheet newspaper knows that I’m bearish on its long-term viability, at least in its current form. It’s my belief that for traditional newspapers to survive the permanent movement to microcontent and micro-attention-spans, a substantial rethink on how a newspaper is designed, printed and marketed is required. If newspapers evolve the way I think they will need to, we may see the price of some daily newspapers skyrocket into the $5-$15 range. Recently I stumbled across an interesting article about Mario Garcia and his current effort to redesign the Wall Street Journal. Mario Garcia is among the world’s most famous newspaper designers and when an authoritative agent for change walks into a very old-school publication and ‘moves furniture around’ the process must be both frustrating and incredibly interesting. Apparently, I’m not the only one who thinks there is little life left in the broadsheet newspaper. Still, the Journal likely won’t adopt the one idea Garcia thinks all newspapers will eventually embrace: a conversion to tabloid size. 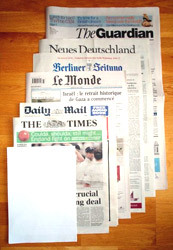 If not tabloid, perhaps the berliner format (a bit taller and wider than tabloid – think Le Monde, but still considerably more compact than broadsheet) will eventually gain in popularity amongst newspaper publications. Garcia looks ahead and clearly sees the writing on the wall – the front-end of the Echo generation is getting older, and soon they will be within the crosshairs of a newspaper-subscriber demographic. Garcia reasons that an audience raised on cable TV and the Internet needs a more portable, navigable newspaper. Today newspapers are in a real tough spot, they have to cater to their loyal (sorry to be blunt, but older) readers while trying to make the paper something a younger reader would want to buy. Unfortunately, that’s an extremely, if not impossible thing to do because of how divergent the wants and needs of those demographics are. If people think the newspaper business is undergoing a transformation now, just wait, you ain’t seen nothin’ yet! As the Echos age and hit their 30’s newspapers will have no choice but to cast aside the needs of the dwindling older few in an attempt to make news on paper something the Internet generation really wants in their hands. “What we know about the reader is that he or she today is very tech savvy,” he said. “They’re surrounded with iPods and cameras and all of this, and the second thing is impatience. They don’t give you a lot of time. They don’t read the newspaper like Grandpa used to read – page by page, waiting patiently to get to sports. They look at Page 1, they see a story about Tino Martinez hitting a home run, well, (they) want to see it – immediately.””…no one is acknowledging yet that people spend 20 to 30 minutes a day with them, and we’re still editing and designing this stuff as if people are spending two or three hours a day with it. Newspapers have largely been produced for the satisfaction of other journalists, and the jig is up now.” says Gaspard of the Las Vegas Sun. How will newsprint survive in the long run? In one word: prestige. Newspapers may become status symbols. Not everyone will be able to afford one. If you’re carrying around a newspaper, it will have to say something about who you are. How many people would plunk down $10 for a Tuesday newspaper? Not many, perhaps. But the newsprint of the future, printed and presented in revolutionary ways, may best be morphed into a symbol for wealth and chic. News for the masses on paper? It appears to be dying, and I’m not convinced the net-savvy Echos will ever embrace it enough to revive the medium under that premise. However, the Echos are the most brand-conscious cohort the world has ever seen. Convince the Echos that a newspaper is something they want to ‘be seen’ carrying, in essence by turning the newspaper into something as trivial as an accessory it may actually give it more importance and appeal to the readers of the future. Sound crazy? Well, this is the same generation that has turned a communications device into chocolate candy. Everything from earrings and pendants to radios are now being sold in phone-shaped versions. When ShopNBC.com five months ago began offering gold cell-phone charms adorned with topaz and diamonds, it tapped into a gold mine. In early March, the retailer sold more than 100 at $69.99 each during a TV segment lasting less than two minutes.The cell phone is rapidly becoming one of the most powerful symbols for all that’s cool, young, and on the move. It’s “a cultural icon,” says Victor Chu, fashion technologist at Parsons School of Design in New York. Nearly half of the U.S. population (2002) now owns a cell phone. For kids and adults alike, a phone-shaped accessory carries a clear message. “What’s hanging off your wrist is a way to communicate who you are, that you are open to communication,” says Steven Goldsmith, general merchandising manager at ShopNBC.com, owned by ValueVision Media (VVTV ). Think about it. What would a newspaper have to be, have to look like, have to feel like, to fit that description?